A.T. Helix does not take herself too seriously. She giggled as she tried to get all of her documents in order; there were a lot of them. “You didn’t tell me there were going to be pictures!” she protested, then shrugged and laughed some more. Being photogenic has never been something that A.T. has cared about. A.T. has never really cared about looking or acting like anyone expects her to; which is good because she definitely doesn’t act the way anyone would expect. In many ways, A.T. is an average college student. She studies neuroscience at the University of Alabama at Birmingham (UAB). She has papers, exams, and is involved in extracurricular activities. 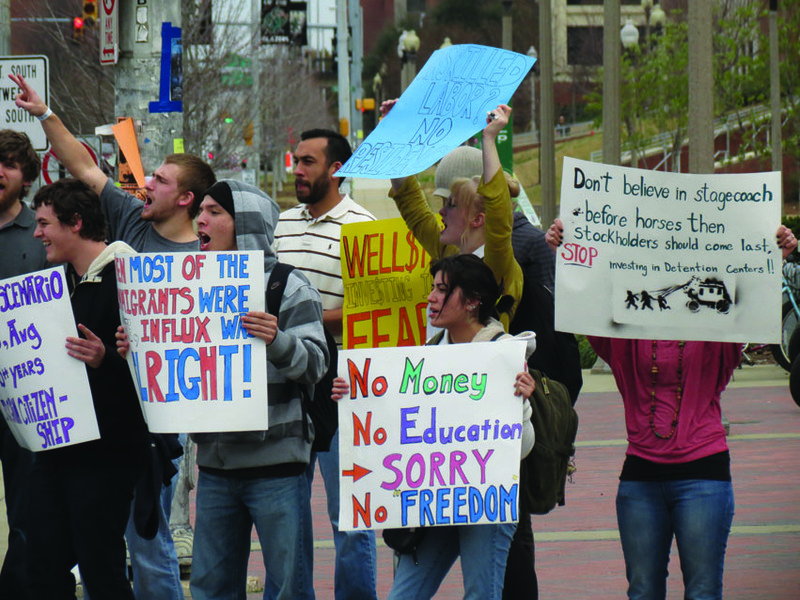 However, her extracurricular activity isn’t exactly the “sewing club.” A.T., along with four other UAB students, have started a massive, student-led campaign to fight for the Alabama legislature to repeal H.B. 56. A.T. first heard about the immigration law while she was working in her mother’s law office. A.T. knew she had to get involved in trying to stop the bill. She participated in a march against the bill in September. It was there that she and three other students, William Anderson, Dana Alfarhna and Farrah Alfarhna, decided to form a student group dedicated to immigrant reform. “We wanted to create an event where students from different schools could come together, learn about the injustices going on, and then spread that news to their campuses,” A.T. said. As the group discussed what course of action to take, they eventually decided that they all wanted to plan a week of activism, with each day focusing on a different aspect of HB 56. A.T. was chosen to take the lead in planning it, a task that she found daunting. A.T. and her colleagues planned a five-day event. The event started on Monday, Jan. 30 and went to that Friday, Feb. 3. Each event focused on a different aspect of the bill, like the unity event where the all participants wore yellow for the people that have went missing, and “Surviving with No Water,” where participants passed out water bottles that had information about HB 56 on them. 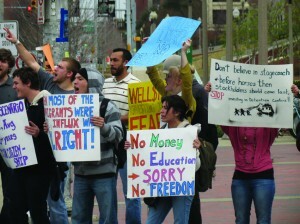 The protest was made up of students, from UAB, Samford, Birmingham Southern, Montevallo and Jefferson State. The biggest demonstration was on Friday. 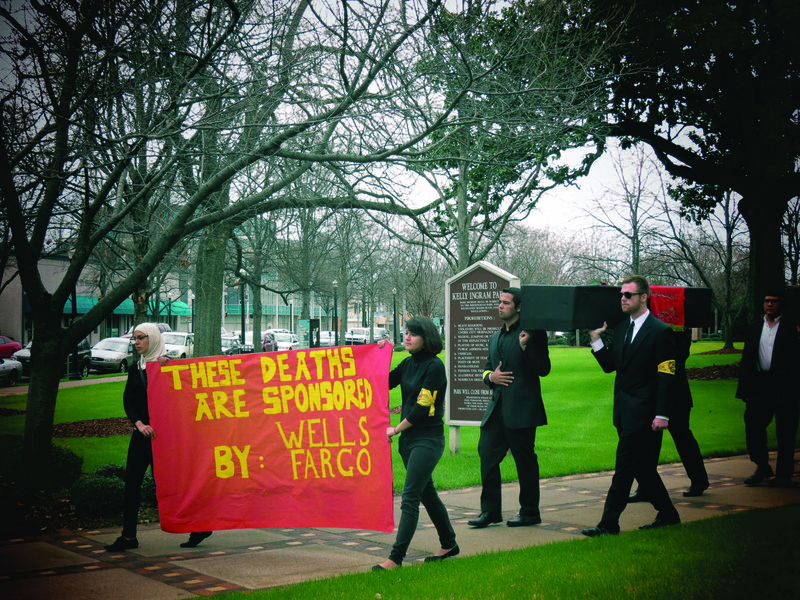 That day, the students held the “Wells Fargo Death March” to protest private detention centers where many undocumented immigrants get sent to since the government cannot legally hold them over a long period of time. The march started in Kelly Ingram Park. The protestors were dressed in black, and several people carried caskets. Each casket represented a real person that had died in a detention center. 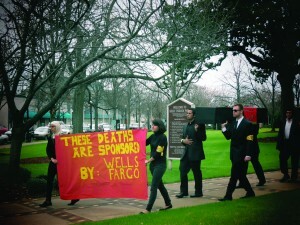 They then marched to Wells Fargo, where two priests gave eulogies in front of the office. Now that the event is over, A.T. is focusing on spreading similar events to other college campuses. A.T. admits that she has a hefty goal, but the stories of the people she is advocating for is what keeps her going. While she hopes one day there will be a better way, right now A.T. is planning the next event to raise awareness.